How Does Rent to Own Home Works? A rent-to-own home, also known as a lease-to-own or lease-purchase home, is a house that is up for sell, but instead of selling directly, the seller will allow the buyer to pay rent on the home with an option for purchase. The length of this transaction is usually between one and three years. In order to better understand how a rent-to-own option works, think of it in as a car lease for your house. As the buyer, you pay a rent, a rent premium, and an option fee in order to reduce the down payment for the house later. This type of agreement can be mutually beneficial for both parties; however, it can also come with some hefty disadvantages. Why would a seller want to use a rent-to-own option? At a time when the housing market is stagnant, it may be the best option for a seller instead of paying two mortgages. A rent-to-own is advantageous for the seller as it allows them to make income on their house through the buyer’s rent payment. It also allows both parties time to develop their credit. For buyers, this option enables them to enter an agreement to purchase a home when they currently do not have enough money for a down payment. Paying the rent premiums and the option fee will reduce the amount needed for a down payment on the home. The purchase price, length of rent-to-own agreement, option fee, and rent premium are negotiable between the seller and buyer. Before signing any contracts, it is usually best for both parties to consult or hire a real estate agent. Once the purchase price is put in place, it is set for the duration of the contract. Whether housing prices rise or fall, both parties must abide by the set purchase price. The option fee is a one-time upfront payment and the rent premium is a fixed monthly payment. The option fee is usually between 1 and 5 percent. The option fee and the rent premiums are credited to the buying of the home and the seller takes in the rest of the rent as income. If at the end of the option period (the length of the agreement) the buyer decides not to buy, then the seller keeps the option fee and rent premiums as income. For example, if the parties agree to a price of $100,000, the option fee and rent premium total $5,000 when the option is exercised. From the standpoint of the lender, the price is $95,000 and a 5 percent down payment requirement would call for a down payment of $4,750 instead of $5,000. One thing a buyer should seriously consider before entering into a rent-to-own agreement is whether or not they will qualify for a mortgage in three years. 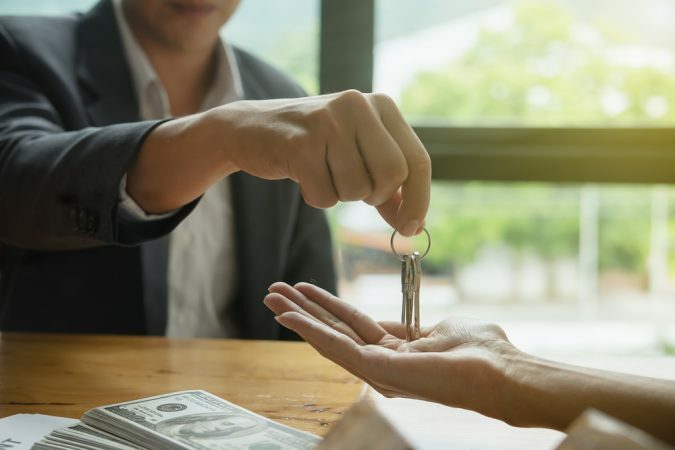 Although this is a great option for those who do not have good credit or a down payment ready at the present, it could be a lose-lose if the buyer’s credit or income doesn’t fall within good standing later. Be on the look out for a later article on the advantages/disadvantages for both parties in a rent-to-own agreement. Shayla is a freelance writer for MyBankTracker. She specializes in credit cards, mortgages, real estate and personal finance issues.